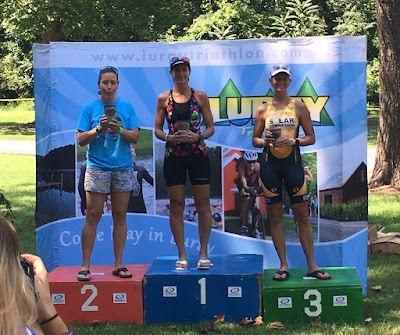 Yesterday I raced the Luray International, which was my first time racing there since 2011. 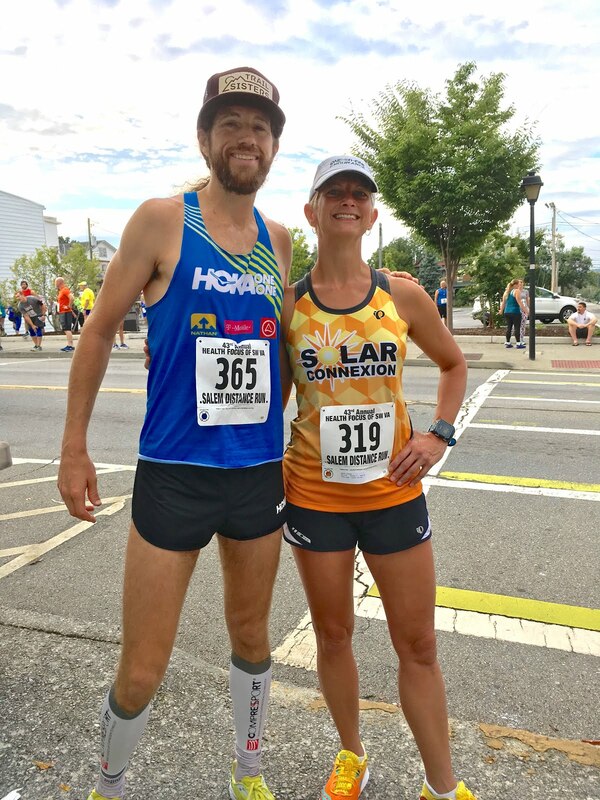 It's a popular and beautiful race in the Virginia region, drawing heavily from the DC and Richmond areas as well as from our Roanoke/Blacksburg corner of the state. The race includes a small pro field in an open/elite division. Things started a little rough for me when something I ate on the way there Friday that did NOT agree with me. I "lost" most of my dinner and did not sleep well. 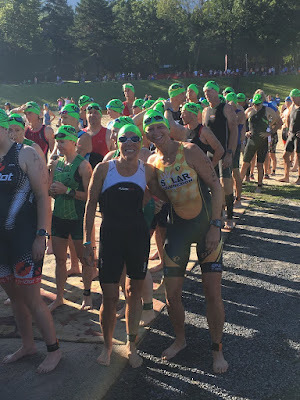 Fortunately I felt OK enough when I got up the next morning and I was very happy to see my friend and training mate Janet (and her husband Gary) had made it to the race. They had traveled up the morning of the race after working very late the prior evening. They'd had almost no sleep! I was super excited to finally meet Paralympian Patty Collins, who is also a coach with Team MPI. While I've worked with her for some time and we've communicated quite a bit, it's the first time we've been together in person! I lined up for the swim with Janet hoping I could hang with her but she pulled ahead before the first turn! 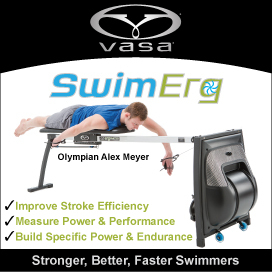 She is strong in the open water and just thrives in the swim. The water felt great and it was busy in the little lake, but not overly congested. 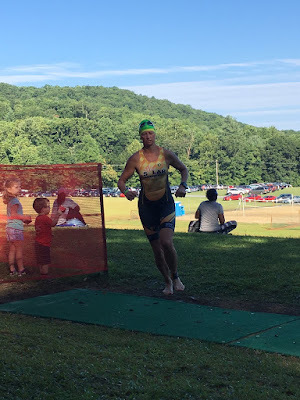 I swam a 31:08 and came out just a bit over two minutes behind Janet on the 1500m swim. I headed out on the bike and stuck to the plan Coach Jim had laid out for me in terms of target power and limits on surges. My legs felt decent but I was burping like crazy from whatever got me the day before. I eventually found Janet and Rebecca about halfway through the 26 mile course. 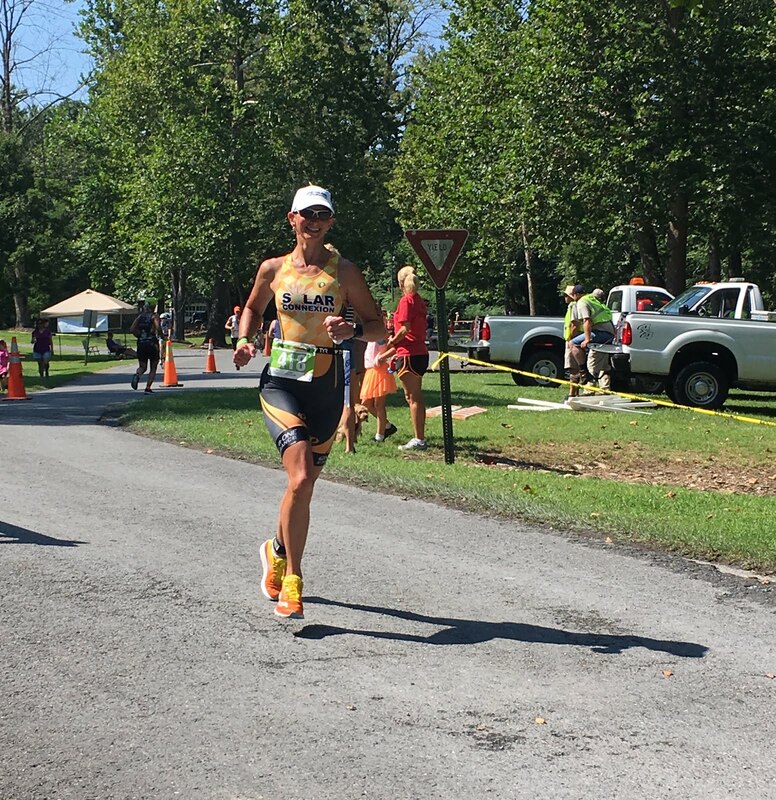 I was happy to see I had the 2nd fastest female bike split among the age-groupers. I don't think it's a secret that I really enjoy the bike leg! Gary and me in the same picture! I came in from the bike as Gary was headed out on the run (or out for lap 2). The run was generally downhill out and uphill back on the two-loop course. It lulls you into a false sense of comfortableness in the first mile or so and then reality hits on the slog back up from the turnaround. On the plus side, my stomach settled in time for the run. It seemed like it was forever to start loop 2, then I got a second wind on the downhill and just did what I could to bring it home. It was not pretty and it was not fast. 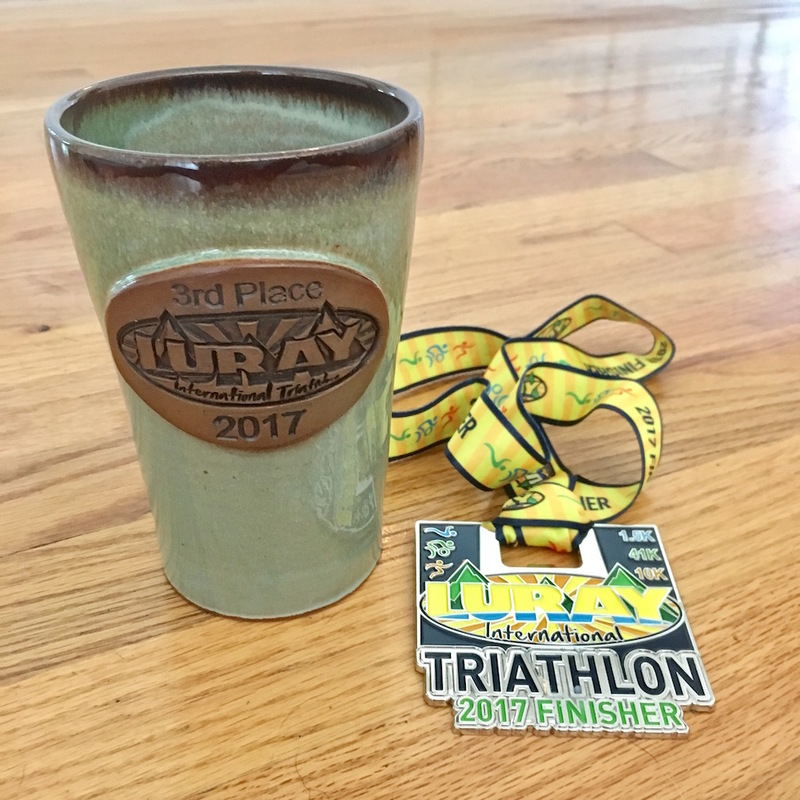 When I looked at results, I saw two master's athletes just ahead of me and was thrilled to see I snuck in as third master's. I was very surprised (and thought it was a mistake) to be announced as third overall. 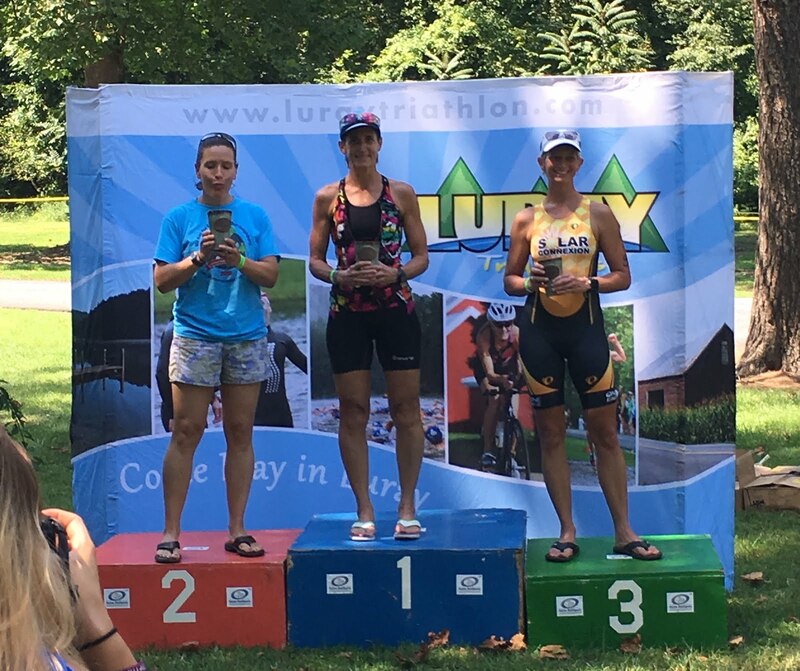 That's because the top five females were in an open/elite division, so the three of us were then top of the age-groupers. I can't say I was feeling too positive on the hot, hilly, turn-y run. If you'd have asked me how I thought I was faring at that moment, I'd have said NOT well. It's a good reminder that we can't judge our own race while we are racing. Keep forging ahead to the finish and do the best you can with the conditions of the day!! You might just be surprised! I look forward to cooler conditions in Rotterdam (remind me of that when I face the cold swim). Thanks to the best ever sherpa and photo-taker Bryan. I'm just 44 days out from Olympic Distance Age Group Worlds at the ITU World Triathlon Grand Final Rotterdam on September 17. 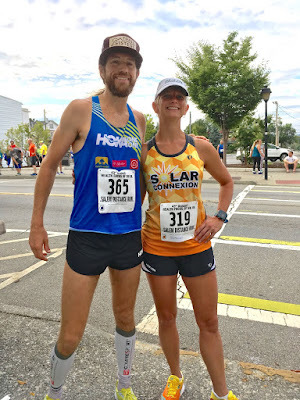 Once our June travel was over, I really buckled down and resharpened my focus to do the right things to be as prepared as possible to have my best race. Coach Jim made adjustments to my training and without teaching and travel to work around, I have a bit more time for it. Gym/strength training 2x a week - so far, so good and I'm enjoying it! The training volume is higher, I'm on the track more, and there's more tempo/threshold work (but balanced with aerobic/easy). Another change is that I've been doing more training with my friend Janet. 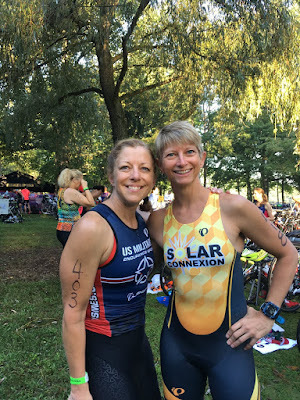 We are in the same age group and have been swimming together for a few years now, but have been sharing more bike and run sessions lately too. We are a really good match across the board and are pretty similar in terms of strength, speed, endurance, punctuality, and attitude! She's a multi-Ironman and a phenomenal athlete and human!! July is always a tough month for me for training because of the heat and the mid-season blahs, but she's made it great! As promised, I took July off of racing. 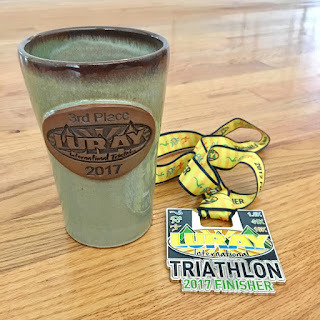 This month I am doing two races. 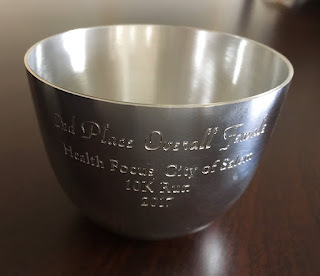 The first is the Health Focus Distance Run 10k in Salem, VA on August 12. This was the VERY first race I ever did in my life in 2008 and I haven't done it since. Then I'll return to the Luray Triathlon for the first time in many years to race the Olympic distance as a tune-up for Rotterdam. I got the Team USA gear. This is the first year ROKA is making the tri suits (top photo) and it's always interesting trying to figure out fit and sizing with a different vendor. At 5'7" and 130 lbs I ended up in a size large and it still feels a tad short...go figure. It's a back zip suit and came with NO chamois and NO lanyard for the zipper. How do they expect people to unzip for the "necessaries?" Luckily I had a spare lanyard and while we could send them back to get a chamois added, I'll just skip it. I took it for a test brick workout and while it was fairly comfortable, it left me chafed. The kids start back to school on Wednesday - a Junior and a Senior!! It's been a great summer and I'm not ready for them to go back. It's not exactly been the restful, sit around, read books, relaxed type of summer, but I'll take it!